Buy the pig. Buy the pig. Buy the pig!!! I had never heard or seen a salt pig before I read this blog! I’m sitting her wondering if I’d use it often enough, but you said you use it all the time. Hmm…. maybe a great “stocking stuffer” idea for the husband. I’m always on the lookout for those fun little things I’d never buy myself. BTW- that polite frenchman comment has me laughing so hard the 3 year old came in from the other room to ask what was so funny. Well, thank goodness someone got it! I love, love, love my pig. Definitely a good stocking stuffer idea. 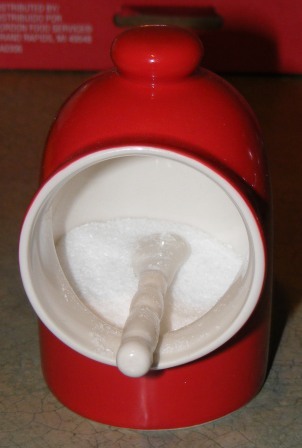 Okay, I know what a salt pig is as I have seen these around for quite awhile, but I don’t know what a Polite Frenchmen is and when I googled it, your blog came up. lol So What Is A Polite Frenchmen? A reference to a comic strip? A reference to a movie? Something else altogether? Educate me. I have a crock that I keep salt in by the stove and I like it…the pig is cuter than the crock, however. The spoon would drive me crazy going in sideways at this point as I do mine from the top so I might be knocking it over all the time…I am adventurous, however, so maybe…changing positions has often spiced things up nicely before…lol. A salt pig…thinking about it. A polite Frenchman is a mythical creature, like a sphinx or unicorn. Get it now? I don’t use the spoon very often. I reach in with a measuring spoon or my fingers to grab a pinch of salt.